One of my weakness has always been bread. We use I have thick white bread and my diet as toast for breakfast then sandwich for lunch. Since eating healthier we have moved on to wholemeal bread which the whole family does prefer now. 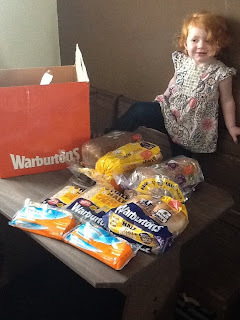 The lovely Warburtons sent me a lovely hamper with a load of healthier alternatives in, to try out. I was quite shocked with the healthier range they do have everything to satisfy everyone. Half & Half bread - This is a mix of huge and wholemeal but it still looks like white bread. Wholemeal and White flour are blended together in this clever, tasty loaf giving you and your family essential fibre and wholegrain in every bite. This product contains 50% white flour and 50% wholegrain flour. Rich And Tasty Wholemeal - Wholemeal with Rye is a delicious, thick sliced wholemeal loaf made with Rye Fibre. Rye is tasty and really good for you. The result speaks for itself. High in fibre, with two slices providing over 25% of your GDA, the new loaf makes it easier to reach your daily fibre intake. What’s more, it’s low in fat and a source of iron and zinc. Seeded Batch - This was my favourite out the lot, I do like the extra seeds in it. All Warburtons Batch breads are baked with their sides touching to make them extra soft. The Seeded Batch loaf is no exception. With a sensational five seed combination of linseed, millet, poppy, sunflower, and sesame seeds it's absolutely delicious! Half and Half Rolls - My son had these for these his lunchbox throughout the week and he liked the change from a normal sandwich. Contains 50% white flour and 50% wholegrain flour. Sandwich Thins - small wraps that can be filled with anything. These was perfect for a slice of ham and bursting with salad. These have been put back on my shopping list. Huge thank you to Warburtons sending us lots of yummy treats to try.